What changes make the 2018 Jeep Grand Cherokee different? The 2018 Jeep Grand Cherokee could become the fastest SUV on the planet with addition of a rip-roaring supercharged V-8. With an all-new Grand Cherokee due for model-year 2019, the 700-horsepower monster would be Jeep’s going-away gift to this generation of its highly successful midsize crossover. The 6.2-liter V-8 is already under the hood of parent-company Fiat Chrysler’s Dodge Charger SRT Hellcat sedan and Challenger SRT Hellcat coupe. In those models, it generates a scenery-blurring 707 horsepower and 650 pound-feet of torque. That would be 232 horses more than the naturally aspirated 6.4-liter V-8 in the 2017 Grand Cherokee’s hot-rod SRT model. Only Jeep knows how much power a supercharged Grand Cherokee would have, or whether it’ll call it the Trackhawk, Hellcat, or something else altogether. More certain is that it’ll be the headline otherwise minor changes as Grand Cherokee heads for its model-year 2019 redesign. Wait for the 2018 Grand Cherokee only if you have a burning need for tremendous speed in the form of the Hellcat-powered version — and can afford what should be a lusty sticker price – even before potential dealer markups. At around $67,000 (including destination) the ‘17 Charger Hellcat exacts a $14,800 premium over the lesser SRT 392. By that measure, expect the Grand Cherokee version to have begin at a suggested retail of nearly $83,000. If Fiat Chrysler’s experience with the Challenger and Charger Hellcats holds, initial demand for the super-powered Jeep should be tremendous. Consult your dealer now about putting down a deposit or risk spending much of the model year on a waiting list. Yes, unless you’re caught up in Hellcat frenzy. The ’17 Grand Cherokee is still among the most desirable and best-selling midsize crossovers. It was updated for model-year 2017 with revisions aimed at the adventurous and the indulgent. Added was a Trailhawk edition as the ultimate off-roader in a line known for off-road ability. It has added ground clearance, Jeep’s Quadra-Drive II four-wheel-drive (4WD) system, a specially configured off-road version of Jeep’s air-suspension system, and assorted cosmetic upgrades that include red front tow hooks. Meanwhile, the luxury-flagship Summit model was updated with a specific front fascia, fog lamps, and grille, 20-inch polished alloy wheels, and a posher interior with Laguna and Nappa leather. Otherwise the line should continue with a choice of V-6 and V-8 gasoline engines, a segment-exclusive turbodiesel V-6, and the already-quick-enough 475-horsepower SRT. Aside from perhaps a new wheel design and some new colors added to the exterior paint palette, don’t expect the Grand Cherokee’s overall look to change. That means it should continue with Jeep’s trademark seven-slot grille up front and bodywork that combines elements of strength and grace that hint at the vehicle’s overall versatility. The interior should again be attractively laid out, with a sweeping dashboard, large and legible gauges, a touchscreen display for the navigation and infotainment systems, and familiar analog controls for the climate system. In addition to the Hellcat-powered newcomer, the 2018 Grand Cherokee lineup should consist of the returning entry-level Laredo model, the higher volume Limited, the off-road Trailhawk, the posh Overland and posher Summit versions, and the high-performance SRT. The Summit should continue with the updated front fascia and grille, LED fog lamps, and chrome-like wheels it received for 2017, along with interior upgrades that include Laguna leather seats with edge welting. The Trailhawk will likely repeat with specific wheels and exterior touches, along with piano black and gunmetal interior trim, and specific leather and suede seats with red stitching. The SRT should again stand out with a black-screen grille, specific bi-xenon headlamps with signature LEDs, a lowered suspension, forged- (instead of cast aluminum) 20-inch wheels, special dashboard instrumentation, and unique front seats. We expect similar distinguishing touches for an SRT “Trackhawk” version. Nothing noteworthy — aside from addition of an SRT Hellcat-powered model. Base engine for all but the SRT and “Hellcat” will continue to be a 3.6-liter V-6, probably again rated at 295 horsepower and 260 pound-feet of torque. Expect Limited, Trailhawk, Overland, and Summit to again be available with a 5.7-liter Hemi V-8, likely again with 360 horsepower and 390 pound-feet of torque (and maximum towing capacity of 7,400 pounds when properly equipped). Those same models should also be available with a carried-over turbocharged 3.0-liter diesel V6 with 240 horsepower and 420 pound-feet of torque for strong launches and that same 7,400-pound trailering capability as the 5.7-liter V-8. The Grand Cherokee SRT should again put 475 horsepower and 470 pound-feet of torque to the pavement via a 6.4-liter V-8; Jeep gives it a 0-60-mph claim of just 4.8 seconds. A Hellcat-powered ’18 Grand Cherokee could have around 700 horsepower and 650 pound-feet of torque. Both SRT models should include selectable drive modes for various situations, including track driving as well as a valet mode that limits performance when you hand the wheel to a parking valet or younger family members. V-6 models, except for the Trailhawk, will again come standard be with rear-wheel drive and be available with multiple four-wheel-drive (4WD) systems. Traihawks and all V-8 models will have 4WD. The Quadra-Trac I 4WD system, expected to remain available with the V-6 engine, works more like all-wheel drive (AWD) for added traction over wet or snowy roads. Likely to remain optional with the gasoline and diesel V-6s, and coming standard with the 5.7-liter V-8 is Jeep’s Quadra-Trac II; this is a full-time 4WD system that includes low-range gearing for off-roading. Again expected to be optional with the 5.7-liter V-8 and the diesel will be the Quadra-Drive II system with an electronic limited-slip rear differential that’s included to further bolster the vehicle’s off-pavement abilities, along with Jeep’s Quadra-Lift air suspension, which is adjustable to increase ground clearance to 10.8 inches, from the standard 8.6 inches (and lower the vehicle when parked for easier access). The SRTs will boast a specific AWD system engineered to maximize on-road handling. All Grand Cherokees should again come with an 8-speed automatic transmission that includes steering-wheel-mounted paddle shifters for semi-manual operation, though it’s possible the Hellcat-powered SRT might come with a six-speed automatic to better handle the added grunt. Doubtful, as we don’t expect any major powertrain adjustments, save for the likely addition of the Hellcat 6.2-liter supercharged V-8 engine. That means the 2018 Grand Cherokee should be EPA rated at 19/26/21 mpg city/highway/combined for the V-6 with rear-wheel drive and 18/25/21 with AWD or 4WD. The 5.7-liter V-8-and-4WD combo rates 14/22/17 mpg and the diesel rates 22/30/25 mpg with rear-drive and 21/28/24 with 4WD. The SRT rates 13/19/15 mpg and is the only gas model for which Jeep requires 91-octane premium fuel instead of 87 octane. Based on the 2017 Dodge Charger’s ratings, expect the Hellcat-engined “Trackhawk” to rate as low as 11/16/13 mpg. Don’t look for much change, aside perhaps for some juggling of features among trim levels and/or option groups. 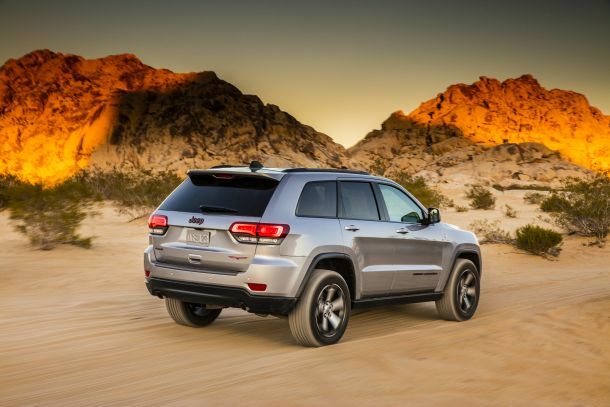 The list of available amenities should remain impressive and allow the Grand Cherokee to offer levels of luxury SUV buyers clamor for these days, along with exceptional off-road and snowy-surface abilities. All versions should again come with Chrysler’s easily operated Uconnect infotainment system with an 8.4-inch display and the Siri Eyes Free interface for iPhones; on the SRT models it should again be used to show various performance timers and gauge readouts. With leather upholstery expected to again come standard on all versions but the base Laredo, upscale options should once more include heated front and rear seats, cooled front seats, and ambient lighting. Overland and Summit models should include wood-trimmed steering wheels and a dual-pane moonroof, with a dual-screen Blu-ray DVD rear-seat entertainment system optional (the latter also with the SRT). On the safety front, the Active Safety Group should return as standard on the Summit and SRTs, optional on Limited, Trailhawk, and Overland, and unavailable on Laredo. It includes autonomous emergency braking that can bring the Grand Cherokee to a stop to mitigate a frontal collision. That ability is required to qualify for the industry’s most-sought-after safety rating, Top Safety Pick+ status from the Insurance Institute for Highway Safety. Its addition isn’t likely until the 2019 redesign. The Active Safety Group also includes adaptive cruise control to maintain a set distance from traffic ahead, blind-spot monitoring, and lane-departure warning. We’ll likely see only modest price increases for the 2018 model year. 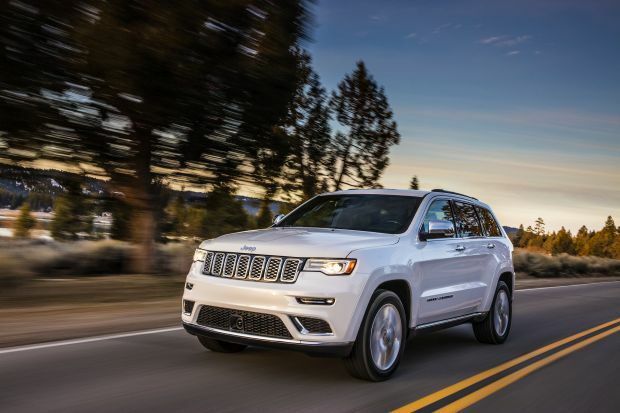 Though the Grand Cherokee will probably continue to be among the pricier non-luxury-brand five-passenger SUVs on the market, it is the only model in its class to offer a V-8 engine and the higher-performance SRT models. That means we can expect the base Laredo with rear-drive to start at around $31,750, and $34,000 with 4WD (all prices noted here include the manufacturer’s destination charge, which for 2017 was $995). The Limited should start at about $39,500, with rear drive and $41,500 with 4WD, with the Trailhawk at around $45,500 with 4WD only. The luxury minded Overland should start at around $46,250/$49,250 and the Summit at about $52,000/ $58,000. With the 5.7-liter V-8 and 4WD, expect the 2018 Limited to start at around $44,750, the Trailhawk at $48,000, the Overland at $52,250, and the Summit at $58,750. With the turbodiesel V-6, the Limited should be priced from $44,000 with rear-wheel drive, and $45,850 with 4WD; the Trailhawk from $49,500 with 4WD only; the Overland from $50,750 and $53,750, respectively; and the Summit from $56,250 and $59,850. The “entry level” SRT should start at about $62,250, and we expect the quicker Trackhawk/Hellcat/or equivalent to start as high as $83,000; both should come standard with 4WD. Option prices should likewise carry over for the most part. Using the Limited model as an example, expect to pay about $4,200 for the Luxury Group II option that should continue to include rain-sensitive windshield wipers, bi-xenon headlamps with LED daytime running lamps, a premium audio system, power tilt/telescope steering column, dual-pane panoramic sunroof, and the basic Uconnect 8.4 infotainment system. Navigation should again add another $1,295 to the cost. The Active Safety Group should cost around $1,495. Look for a 2018 Jeep Grand Cherokee release date in late summer or early fall 2017. Ford Edge, Hyundai Santa Fe Sport, Kia Sorento, Nissan Murano, Volkswagen Touareg. Big-Jeep fans who hanker for a third-row seat should wait for the model-year 2019 into of the 7-passenger Wagoneer and ultra-luxury Grand Wagoneer to be built on the next-generation Grand Cherokee platform. Meanwhile, lane-correcting automatic steering would be a welcome extension of the lane-departure-warning capability. Dedicated off-road adventurers might like to see Jeep add a true locking rear differential rather than the electronic limited-slip differential offered in the current model. And while the vehicle’s Uconnect system is sufficiently versatile and easy to use, it doesn’t yet include the Apple CarPlay and Android Auto operating interfaces that replicate a smartphone’s displays on the infotainment screen.